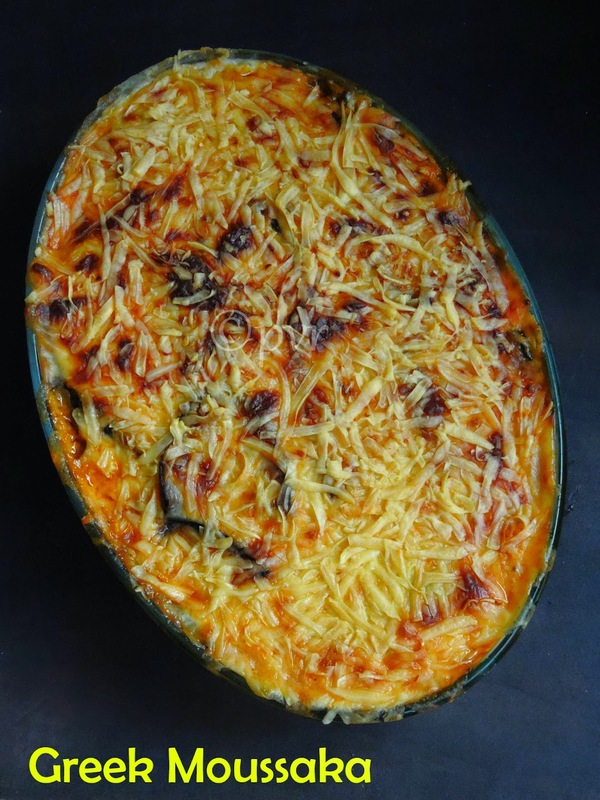 Moussaka is an eggplant (aubergine) and / or potato-based dish in the cuisines of the former Ottoman Empire, with many local and regional variations. 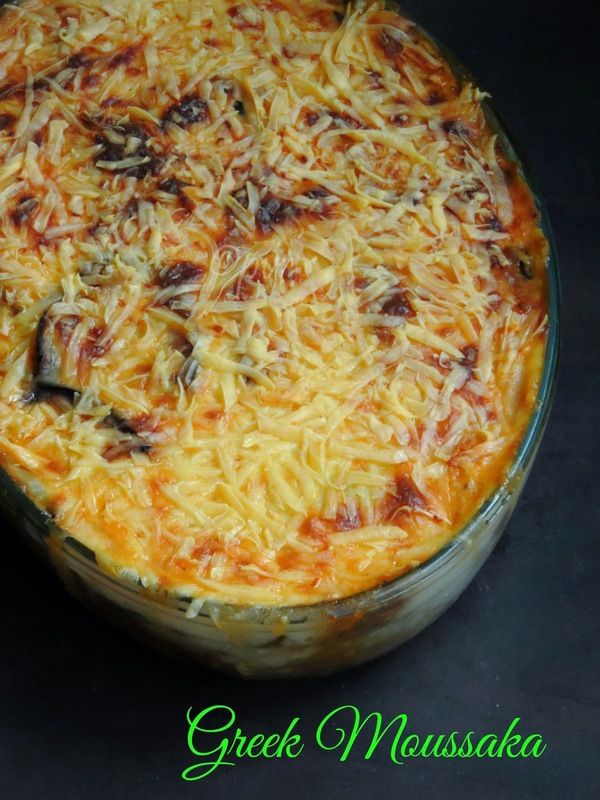 It has three layers that are separately cooked before being combined for the final baking: a bottom layer of sliced eggplant sautéed in olive oil,a middle layer of ground lamb lightly cooked with chopped or puréed tomatoes, onion, garlic, and spices and a top layer of Béchamel sauce. The dish is then layered into a pan and baked until the top layer is browned. This Famous greek dish was in my to do list since a long, finally i baked them at home. Actually i was supposed to post this recipe few days back as a part of this month's Shhhh Cooking Secretly Challenge an interesting event started by me and my partner of this month is Priya Satheesh, she gave me eggplant and zucchini and i used both veggies in this Moussaka, thanks Priya for giving me this fabulous veggies. As per wiki,Moussaka is usually served warm, not piping hot; if cut hot out of the oven, moussaka squares tend to slide apart and consequently the dish needs some resting time to firm up before serving. There are variations on this basic recipe, sometimes with no top sauce, sometimes with other vegetables. In Greece in addition to the eggplant slices, sautéed zucchini slices, part-fried potato slices, or sautéed mushrooms are also included. Moussaka, the cooking process may sounds too long but trust me this dish is definitely worth to try. Drop the sliced eggplants into the salted water and set aside for 30 minutes. After 30 minutes, take the eggplant slices from the water and drain, wipe the water completely from the slices using a kitchen towel. Heat up a tawa and add 1 tablespoons olive oil. Cook the eggplant slices on both sides until it becomes golden brown on each side. Set aside. Cook the zucchini sliced with a tablespoon of oil until they turns golden brown. Meat Sauce: Heat the olive oil and fry the onions until translucent. Add bell peppers and saute for couple of minutes. Now add grated garlic. Add tomato puree, tomato sauce, pepper, salt and all spice. Fry for 3 to 4 minutes. Add the washed minced meat and combine well. Fry for 5 minutes on medium flame. Add the water and cook on high until it boils. Turn to medium low heat and keep it covered while stirring occasionally until the sauce thickens and oil separates. Meanwhile add the sliced potatoes in water with 1/2 teaspoon of salt and boil for 5 minutes on medium heat until the potatoes are just cooked. Do not over cook the potatoes. Bechamel sauce: Heat the milk in a saucepan, bring it to boil and put off the stove. Grease a pie pan and arrange the eggplant and zucchini slices overlapping and covering up the base.Add half of the meat sauce and spread out on top of the eggplant-zucchini layer. Arrange half of the potato slices on top of the meat sauce. Add the remaining meat sauce over the previous potato layer. Layer all of the remaining potato slices on top of the meat sauce layer.Now pour the bechamel sauce over the final layer and smooth out. Grate the cheese and sprinkle on top of the final layer. Bake in the pre-heated oven at 350F for 20 to 25 minutes until the top is golden brown. Let it cool. Mouthwatering moussaka! Bechamel sauce and cheese topping is tempting and it must have made a nice filling meal. i can have just this for dinner. Thanks a lot Priya for this wonderful and lovely looking Greek dish. Wow looks fantastic ! I have read a lot about this traditional dish but the eggplants need to be substituted! Yummy looking mousakka..looks cheesey and tempting..
the toppings look very inviting!! 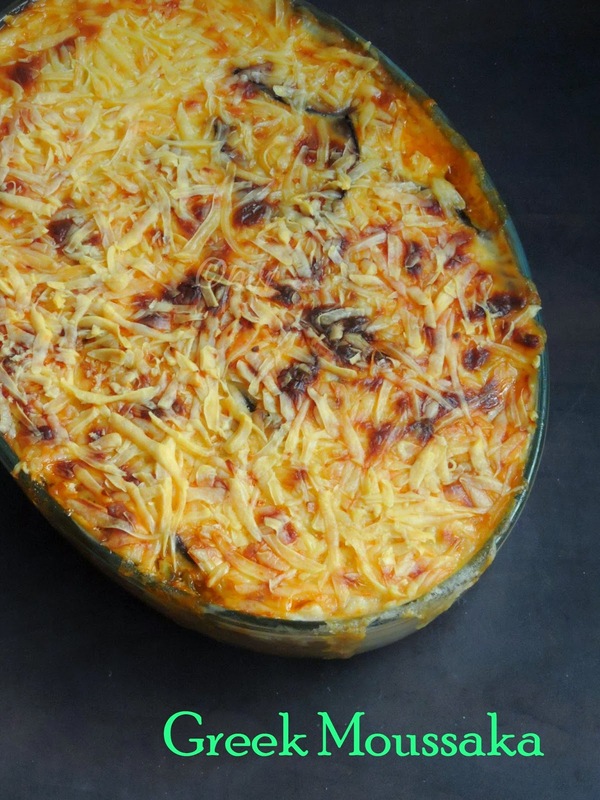 What a cheesy and hearty baked dish. Looks so yummy!! The color shades created during baking make the dish look so appetizing! This is a delicious and yummy moussaka.